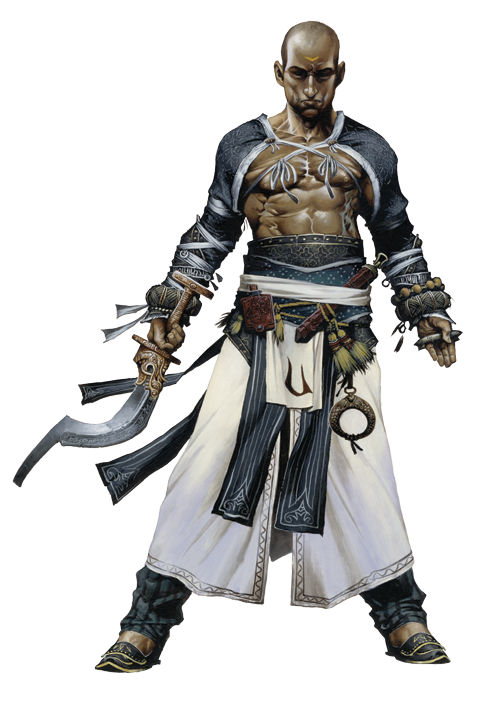 During Combat Sajan uses fast movement and Acrobatics to get into a strategic location in combat, and uses a combination of Combat Reflexes and flurry of blows to deal as much damage as possible to his targets. He employs combat maneuvers when it's strategically advantageous—grappling spellcasters and tripping foes with his temple sword when his allies flank them. Against a particularly powerful single enemy, he utilizes Stunning Fist to take the combatant out of commission.